The six-year-old won five races on the spin during a tremendous first season with David O’Meara in 2014, but was disappointing on his final start in the QEII on Champions Day at Ascot. A 4-1 chance for his first start since October, Custom Cut tracked the front-running Bow Creek before taking over in the straight. Here Comes When came from last to mount a challenge, but Custom Cut was not for passing, sticking to his guns to take the Group Two prize by a length and a half. 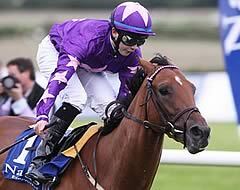 Winning jockey Daniel Tudhope said: “He’s every jockey’s dream as he travels well and gives you everything. He tries his heart out every time. “He’s an improving horse and did well last season. It’s a good start to this season and hopefully he can keep going. I think Group Ones are probably on the agenda."